Tonight, we went to Hula Grill in Whaler's Village for dinner. They have a dining room and bar area, and there's a beautiful ocean view from most of the tables. 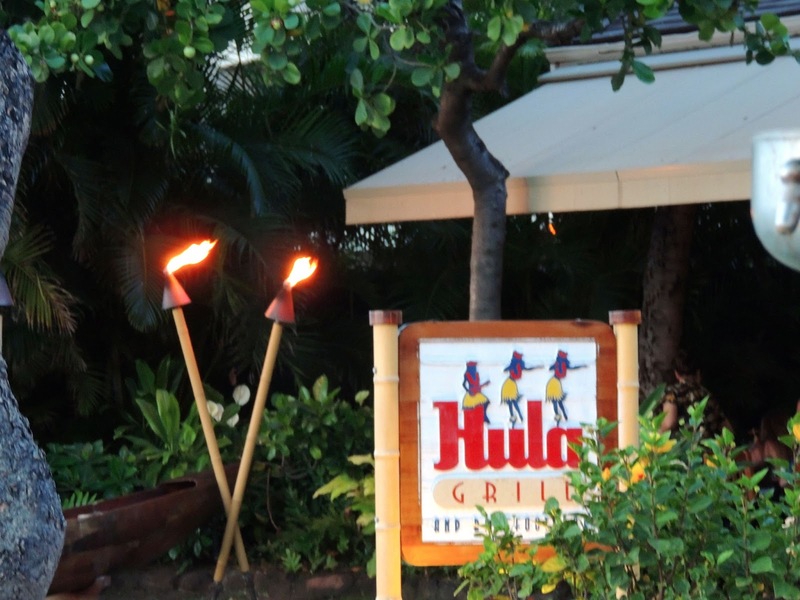 We arrived during the early dinner hours when they offer a chef's tasting menu in the dining room. For one price you get a pupu (appetizer), entree and dessert. They're smaller portions, but it's definitely enough food to fill you up. We each ordered off of that menu. 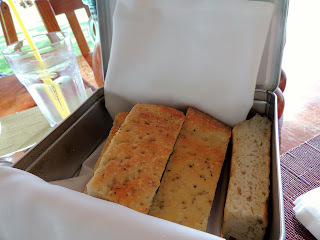 While we were waiting for our pupus, we were giving a metal lunchbox full of focaccia bread. It was delicious especially when we dipped it in the mango chili sauce! We were sitting in the dining room near the bar area, and there was live music coming from the bar area. It was very pleasant. For pupus, I ordered the Jumbo Lump Crab Cake. 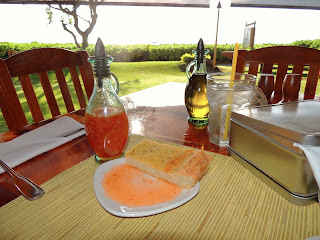 It came with lime-cilantro aioli and li hing mui compote (tasted like papaya). 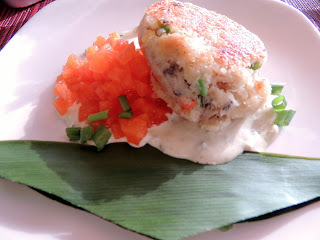 The crab cake had corn in it, which surprised me, but it was really delicious. My husband ordered the Hand Wrapped Pot Stickers. It came with one Kalua pork pot sticker and one lobster and scallop pot sticker. They were both good and tasted as you would hope. 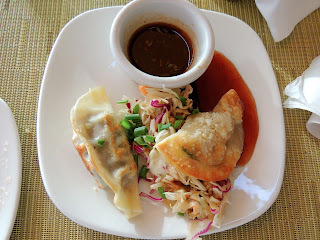 The Kalua pork one was like a luau in a pot sticker. As for entrees, we were really in the mood for some good fish, so we each ordered a fish entree. 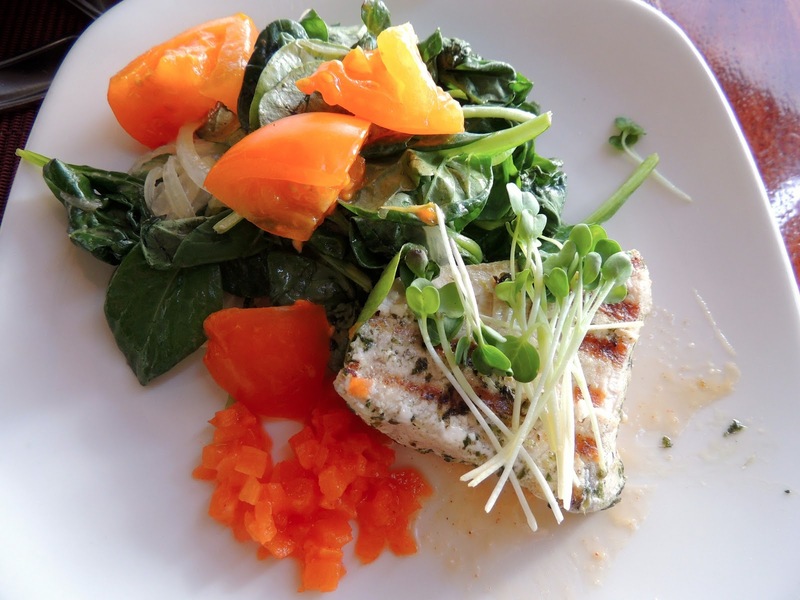 I ordered the Herb Grilled Fresh Fish which came with a tot soi salad (really good) and li hing mui compote. The fish was a type of swordfish. It had a delicious flavor, but the texture was a little tough. My husband ordered the Macadamia Nut Crusted Fish, which is one of their most popular entrees. 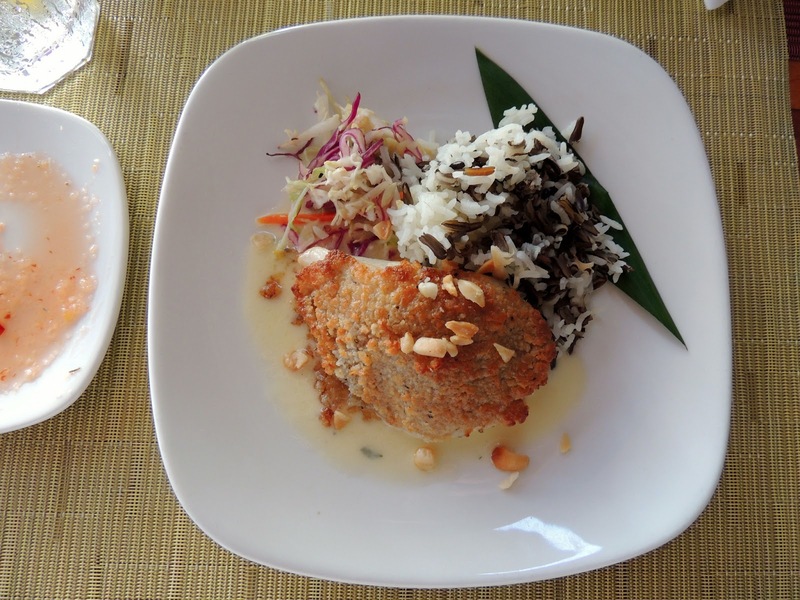 It was baked with lemon beurre blanc, and came with wild rice. The fish was a butter fish, and it melted in your mouth. That's what I would order next time. For dessert, my husband ordered the pineapple upside down cake. 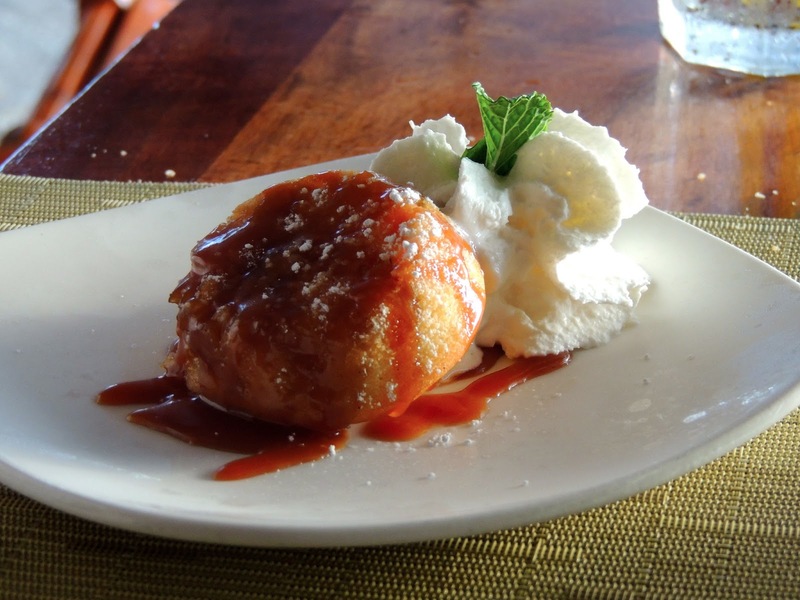 It came with a caramel rum sauce, which was rich and not too sweet. I usually expect a ring of pineapple on pineapple upside down cake. This was more like a mini muffin size cake with a delicate pineapple taste. It was good but not the best pineapple upside down cake ever. My dessert was the Petit Ice-Cream Sandwich, which was anything but petit. Since this was the tasting menu, it was only half the size of the usual dessert, but it was still huge. My husband helped me eat it. It was rich vanilla ice-cream sandwiched between macadamia nut brownies. Amazing. Over all, no complaints. We both loved our meals, and we may be back. 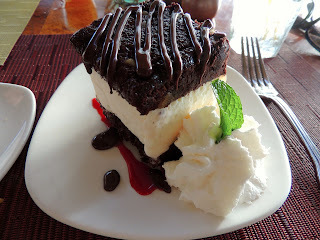 In short, both pupus we tried were great, the Macadamia Nut Crusted Fish is a winner, and even the "petit" Ice-Cream Sandwich is a huge and delicious dessert.